Whilst in the beautiful surrounds of Seasalter, my plan is to do some serious work on my masters course. I have the draft of my next assignment due at the end of the month and I want to have a less stressful experience than what I had for the first assignment. For this assignment, all I managed by the draft due date was an introduction followed by section headings as an outline. When I finally found time to dedicate to writing the 5000 word essay, I decided to completely re-write what I had done up to that point so I ended up writing the thing basically from scratch the weekend before the Monday it was due. This was quite a painful ordeal and I had to sacrifice a brunch invitation at the Park Royal Hyatt in Shinjuku to boot! Although it all turned out ok in the end and I passed the module, I really, really, really want a smoother, less panicked lead up to this assignment due date. And I definitely don’t want to be forced to turn down any eating experiences! So, to this end, I’m taking time every day to work on my masters. Sure, I’m also checking the FB way more than usual, blogging about my trip every day and enjoying time with my friends but I am on holiday after all! Whilst in Seasalter though, I have made a lovely routine. Every day I get up and work for a few hours at Kim and Vicky’s house. Then I pack up all my gear and walk in to Whitstable which is about 45 minutes away by foot. 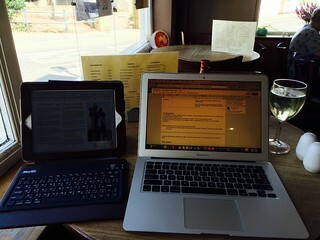 There I find a nice pub with wifi, have lunch and continue working for a while before heading back to Seasalter where I relax for the rest of the evening. 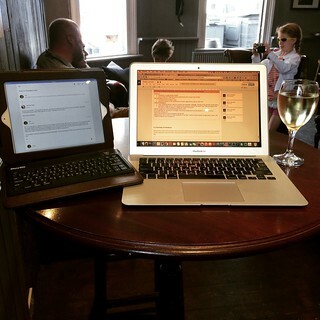 So I’ve decided to dedicate this post to the best pubs to study your masters in Whitstable! Just enough room for my wine on the table with all those electronics! Quality of food – I found the menu lacking in any plant based options. The fish and chips came with the traditional peas but that was about it. As a ‘ridiculously loose when on holiday’ pescatarian, I was trying to do my best to add some veggies. I enquired if the fish pie came with a salad and was told that sadly, no it was just the pie. So I ordered salt and pepper squid as I wasn’t really that hungry. I couldn’t find the pepper for the life of me but it didn’t matter because it was delicious! Price – mains were about the £14 to £15 mark but the squid was an entree so was half that price. The large house white that accompanied it was £6.50! Atmosphere for studying – very conducive. Quiet background music. Busy with patrons but not to the extent that it was too noisy. And I got a table right next to a power outlet which was great! Patrons were friendly and talked to me too which was nice to break up my work. Whoops – drank the wine before taking the photos! Quality of food – A much more veggie friendly menu. Again I wasn’t that hungry so I went for the crab cakes which were listed under the salad options. A lot of the food had an Asian twist to it that made me feel at home and the crab cakes were no exception with a lovely sweet chilli dipping sauce and plenty of sesame added to the salad. Yum! Price – Very reasonable and student friendly with even mains being around the £8 mark. My large house white was again £6.50 which was almost as much as my lunch. It was more than my lunch when you consider I drank two! 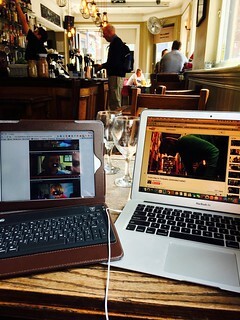 Atmosphere for studying – music was a bit loud to be honest but spot on in terms of my era! There was a power point near a small table though which suited me and over all less customers so less crowd noise. Also less spontaneous interaction which I’m a bit sad about. I wandered into Whitstable today with no direct plan. I walked up the high street and ended up in the, hmm, looking around the pub and can’t find the name of it. Hang on, I’ll just pop outside… The Quayside Freehouse! Too nice a day to be inside but the wine deal convinced me! From the exterior and a brief look in through the windows, I could tell this was a bit of a rougher style pub. I took a deep breath and headed inside for today’s review. Quality of food – Finally a pub with a decent veggie option. I had the grilled vegetable lasagne with chips and salad. Very tasty. Price – Very economically priced for students. My meal was just £7.95 and therefore the cheapest of the three pubs I’ve visited. But that wasn’t the clincher. On ordering my standard large house white, I was informed that if I intended to get two glasses (well duh!) then I would receive the rest of the bottle free! “Done!” I said in triumph! This is the biggest pub I’ve worked in but not too loud or busy so quite good for working. No obvious power outlets near the tables though so I will have to pack up as soon as my battery runs out. I did help out a retired couple who were trying to get directions to a store from the waitress. I brought over my computer and we looked it up on a map. They were very happy! What is it with old people and maps? Mum, Aunty Peta – any thoughts? All photos are by Merilyn Winslade and shared on Flickr. Maps help so that you do not cover all those extra miles getting from A to B!!! !